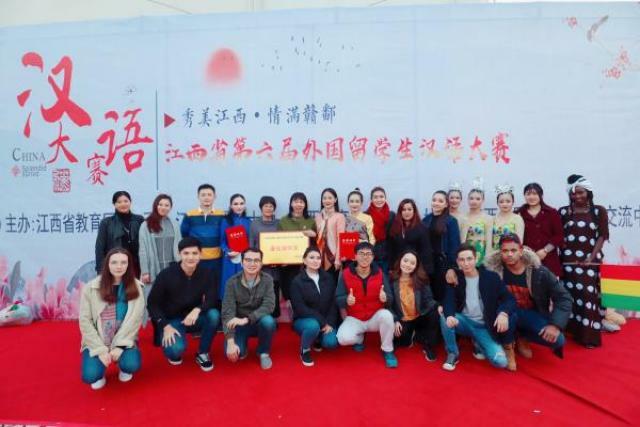 The 6th Provincial Chinese Competition for Foreign Students finally concluded on November 25th in Wan Li Campus of Jiangxi University of Traditional Chinese Medicine. Through the fierce competition of the preliminaries, semi-finals and finals, JUFE’s international students OUTHAKAYSONESOUPHANSA (Ou Suna), from Laos, performed well and won the second prize; BAYARTOGTOKHUURIINTUYA (Tu Ya), from Mongolia, and OSPANOVNURTAZA(Song Hua), from Kazakhstan, won the third and excellent prize respectively. JUFE was also awarded the prize for the best organization. 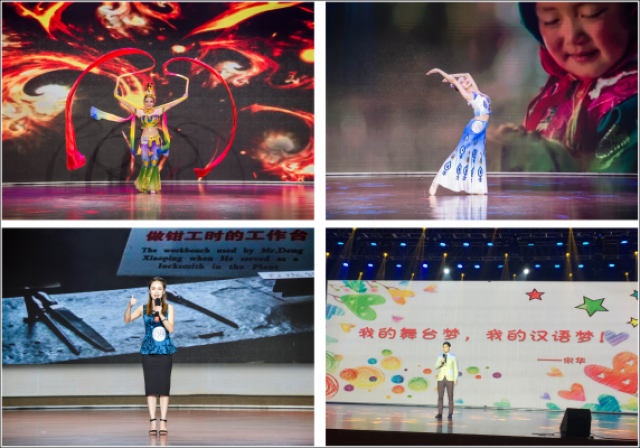 The contest was hosted by the Educational Working Committee of Jiangxi Provincial Party Committee and Jiangxi Provincial Educational Department and undertaken by Jiangxi Educational Television and Jiangxi University of Traditional Chinese Medicine. Provincial CPPCC Vice Chairman Tang Jianren, Provincial Education Department Director Ye Ren-sun and Provincial Education Department Vice-Director Wang Jianghua presented and watched the final of the competition. Nearly sixty contestants from eighteen universities of Jiangxi Province participated in the competition this year, which is the most competitive, in the highest level and have the largest number of contestants. The competition has three stages, including college selection, provincial selection and the final. After a rigorous college selection, JUFE selected three international students to participate in the provincial selection and final stage. In the final stage, JUFE’s contestants: Ou Suna and Tu Ya were full of confidence and performed well and both won the top 10. 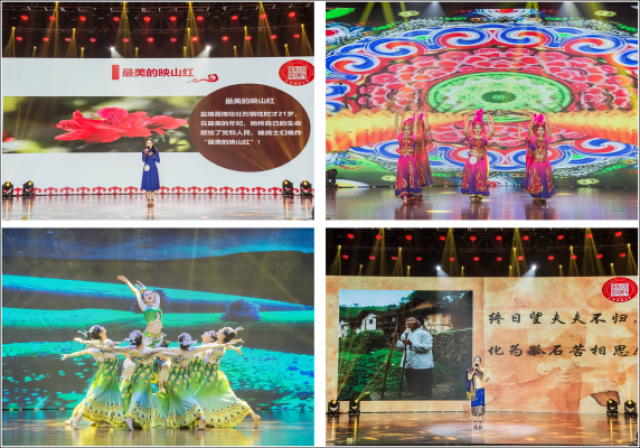 The final have three parts: “talent show”, “Rhododendron red-passion for homeland”, “Camphor green-knowledge of green, and “Jacqua chinensis-Jiangxi’s Culture”. In the first part, Tu Ya performed a piece of Xinjiang Dance Mysterious veil, perfectly showing the features of Xinjiang Dance: beauty, dexterity and delicacy. The audience were instantly ignited by this piece of passionate dance. “Impression of Banna” performed by Ou Suna was even more impressive. Sometimes, her lightly and graceful dance steps on the stage were buoyant yet skillful, sometimes bold and exhilarating, judges were amazed by the styling features danced by her, like the posture of three bends; combining vigorous steps with delicate action; associating the dynamic movements and static stretches. Her dance pushed the contest to the climax. At last the two contestants won top 6 with high scores. In the second and third parts, Tu Ya retold a touching story about the most beautiful lady in history named Huaizhuang. She affectionately restored the movie scene of “Sparkling Red Star” that Pan Dongzi used her wits to deliver salt to the Red Army soldiers during the revolutionary times. Ou Suna made a speech “Waiting for my Rock”, representing a touching story that Chi Yuhua waited for her husband all her life because of the solemn commitment they made. With standard Chinese accent and full emotions, she moved everyone presented. As a result, Ou Suna and Tu Ya won the second and third prize respectively. OICE (office of international cooperation and exchange of JUFE) has always attached great importance to such competition. Before the contest, not only were teachers asked to conduct one-to-one Chinese tutoring, but also invited Ms Xi Zhenying, a teacher from School of Art of JUFE, to serve as art guidance. On the day of the final, Director Xiao long appeared to the site to cheer up and calm down our contestants, she told them to be confident, perform well, and to win honor for JUFE. Other teachers from OICE also showed at the site and cheered up these students. This competition effectively tested the Chinese language level of JUFE’s international students, the outcomes that JUFE has achieved in Chinese language teaching for international students, and the level of JUFE’s international education.